Japanese Episode DP 142: "The Worst Togepi Ever!" American Episode 1237: "Where No Togepi Has Gone Before!" The Rocket-Dan have created a secret base! While celebrating a successful attack on Satoshi on his friends, the Rocket trio discovers a Togepi that had wandered into their base. 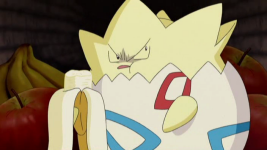 When the Rocket-Dan attack the pokemon for eating all their food, it vanishes and is replaced by a kinder, more pitiable Togepi. The Rocket trio becomes convinced that there are two Togepi - one evil, and one good - and vow to make the evil Togepi pay. Meanwhile, Satoshi and his friends are trapped in a jail cell elsewhere in the base. 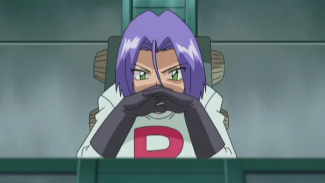 The Rocket-Dan are eventually tricked into the same jail cell as the evil Togepi finally comes forward. Satoshi-tachi and Musashi-tachi get ready to battle, but the egg pokemon uses Attract to make slaves of Pikachu, Potchama, Gureggru, and Nyasu! Togepi and its new followers make their way to a cockpit in the base and initiate the a launch sequence! Musashi and Kojirou explain that their secret base is built around a rocket, so our heroes determine that the evil Togepi wants to go into outer space! The rocket blasts off and leaves the planet's atmosphere, but it is quickly knocked back down to earth by a territorial Rayquaza. The rocket plummets toward certain death, but by working together, our heroes and villains are able to land safely. Once the rocket lands, Togepi just gets up and leaves, saying that it's tired. Our heroes, confused at the events that just took place, shrug it off and continue on their way to Suiren Town. Oh, evil Togepi. One of the best things to come out of Diamond & Pearl EVER. This was a fun and crazy episode, but it also didn't make a whole lot of sense. The first half just kind of wandered around listlessly, not really knowing what it was doing, while the second half had everyone going up to space for no goddamn reason. And then there's the fact that the Rocket-Dan earned enough money selling snacks at a small town festival to be able to afford a rocket that can launch into space. But the general silliness of the whole thing kind of made all of that forgivable. 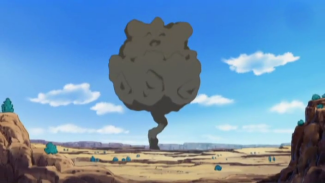 It's the kind of batshit insane episode that reminds me of Kanto, and I don't think I'm alone when I say that we have an instant classic on our hands with this one. I also really liked how everyone's pokemon got to contribute in one way or another. Equal screentime makes me very happy. Oh, and hey! Gender confirmations! I really don't give a crap about pokemon genders, to be honest, and we've had hints about Pikachu's gender for a while, but it's still nice to have concrete, undeniable confirmation like this. I also love how, despite how undeniable it is, there are still some people out there who aren't convinced by this episode. Crazy, sad people. This episode also features more homages / parodies of things than most episodes in recent memory. Aside from paying an homage to original series Episode 188 "Himeguma's Secret" (an episode that also had its screenplay written by Yonemura Shouji), this episode also features parodies of Space Battleship Yamato, Neon Genesis Evangelion, and the Time Bokan series. Fun times. The dubbed version kept every single piece of background music, didn't censor those martini glasses at the beginning, and had a really spot-on script. I mean, really...what more could you realistically ask for? I know it seems like I can have some really unrealistic expectations with this franchise sometimes, but really...the way things were done in this episode is all I need. A good script and the original music is all it takes. Please keep up the good work, TPCI. Your dub is so much better when you leave things alone. The evil Togepi and Rayquaza keep their Japanese voices. There are a few small things I wanted to bring up in this episode's otherwise impeccable script. 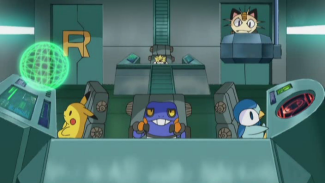 Nyasu's robot is called the Sakaki-sama robot in the original, but the dub decides to have Meowth call it the Boss Bot instead. Wonder why they didn't go with "Giovanni Bot" instead. Jessie: "A one-way blast off from playing the fool!" Originally, Kojirou stated that they like rockets because "rockets mean romance," while Musashi states that "rockets mean hopes and dreams!" It's the kind of zany romanticizing of mundane objects that this trio loves to do, but it's almost never brought over to the dub. This one, unfortunately, was no exception. James: "Leave the driving to me! I'll have you know mom and dad gifted me a real rocket ship for my tenth birthday!" Originally, Kojirou never mentioned anything about owning a rocket or getting one for his tenth birthday. He simply stated that he remembered playing with one when he was a kid. It's weird that TPCI would choose to have him say that he got a rocket for his tenth birthday, considering what tenth birthdays mean to this series. Dawn: "Well, every rose has its thorns. So I'm guessing even a Togepi can have a darker side." This is actually a pretty accurate translation of what Hikari says, but it's slightly different due to an untranslatable pun. Originally, Hikari says that beautiful roses have thorns (toge) and that, likewise, Togepi have poison in them. Since Togepi isn't called "Thorn Chirp" (which is more or less what its name would translate to) in the English version, this repetition of the word "thorn" (toge) gets lost in translation. Still, the line the dub replaced it with was good enough, so I can't complain.